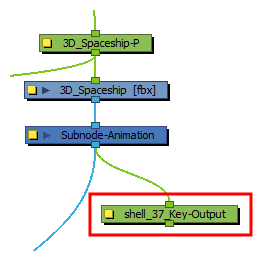 It is possible to apply the animation on a 3D model's subnode onto other elements such as 2D layers, pegs or other 3D models in the scene, making the subnode act like parent peg to these elements. 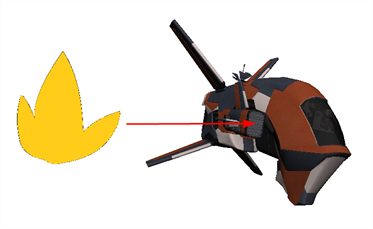 This can be especially useful of a decal or an effect is meant to follow a specific part of a 3D model. 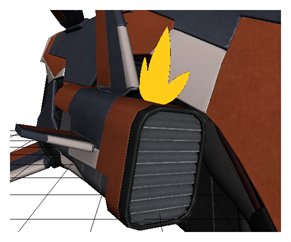 In the Camera or Perspective view, using the Transform tool, click on the 3D model to select it, then on the part of the 3D model that you want to rig to another element to select its subnode. 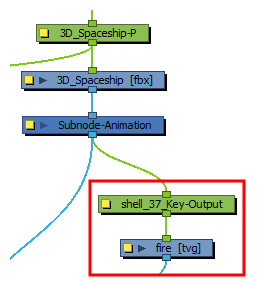 In the 3D Graph view, select the subnode which you want to rig to another element. In the 3D Graph view toolbar, click on the Add 3D Kinematic Output button. 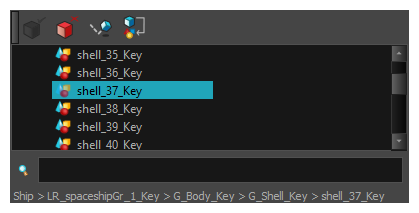 Open the 3D Graph view menu and select Insert > 3D Kinematic Ouput. 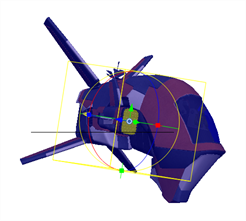 A 3D Kinematic Output node appears in the Node view, connected under the 3D Model's Subnode Animation node. The 3D Kinematic Output node is named after the subnode, followed by -Output. An asterisk appears right of the name of the subnode in the 3D Graph view, to indicate the connection of the 3D Kinematic Output node. In the Node view, connect the output port of the 3D Kinematic Output node to the input port of the element that should follow the subnode's movement. In this example, the layer fire will follow the movement of the shell_37_Key subnode. Any transformations made to the 3D model subnode will now also be applied to the drawing.